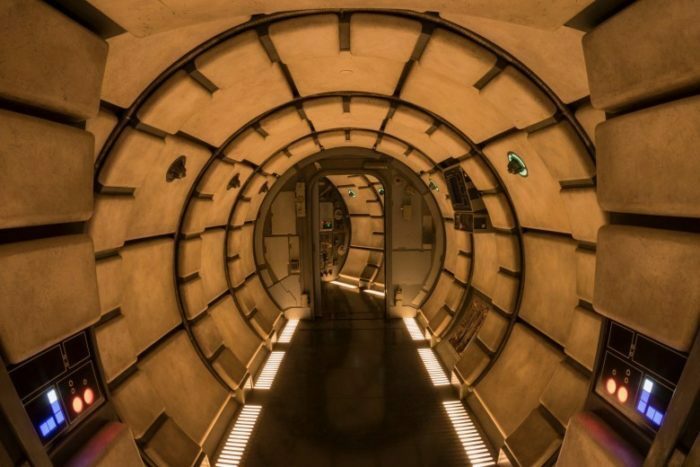 Have you been to Millennium Falcon Recently? Star Wars: Galaxy’s Edge, due to open August 29, 2019, will feature two new attractions, one of which will give guests the opportunity to fly the Millennium Falcon. In November 2017, Chapek revealed this ride will be named Millennium Falcon: Smugglers Run. Without giving away too many spoilers: Guests will receive a mission and then take on three critical roles: Pilot, Flight Engineer, and Gunner. You’ll have to fire lasers, steer the vessel, and activate hyperspace — and the outcome of your mission actually affects other experiences within Galaxy’s Edge. How you perform on the mission holds even bigger stakes: perform with skill and you may earn extra galactic credits, while bringing the ship back banged up could put you on the list of a bounty hunter. End up on Harkos’s list and you may face a problem if you show up at the local cantina! SPOILER ALERT: The following is a more detailed description with spoilers! The setting: a village of Black Spire Outpost on the remote planet of Batuu. Your mission begins here in a spaceport, where the 110-foot Falcon will start its engines and vent thrust gases while docked nearby in a maintenance bay. The queue takes you into Ohnaka Transport Solutions, where you’ll see communication equipment and cargo containers full of Storm Trooper armor. Eventually you’ll make your way up to a second-story switchback on a catwalk. There you’ll see, “an animated blaster-riddled starship engine suspended from the ceiling” glowing red. As you weave through the queue, keep an ear out for the Ohnaka workers. You’ll also be able to see the Millennium Falcon from several different angles while waiting to board. Time for your mission! 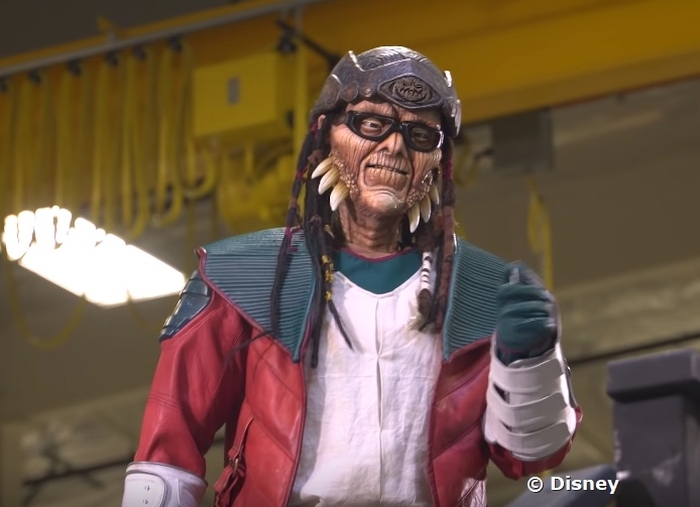 You’ll receive the details for your smuggling mission from an animatronic of the dreadlocked space pirate, Hondo Ohnaka and his droid R5P8. 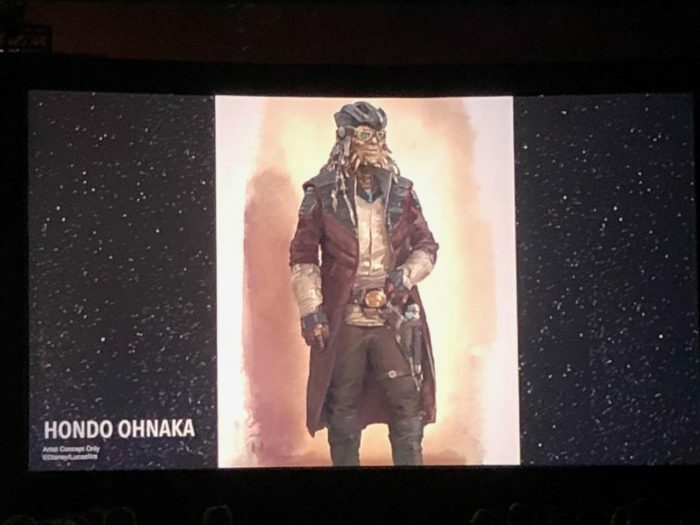 Hondo is voiced by Disney legend Jim Cummings, who voiced the character in the Star Wars series (he’s also the voice of Winnie the Pooh, as well as many other Disney and Star Wars characters). The droid keeps everyone on schedule and fixes equipment in the command center. Then, you’ll see the Falcon hover behind them on a video screen. Smugglers (you) will then wait to board in the Main Room of the ship, where they can play hologram chess (Remember: “Let the Wookiee win!”) and take photos while waiting for Hondo to dole out pre-flight instructions and assignments. He does so via monitor, and now it’s time to jump into the cockpit! Six riders get into the cockpit — two pilots in the front, two gunners in the middle, and two engineers in the back. This is very interactive as switches, levers, and buttons make sounds when activated. The hangar bay is seen outside your windows, and it’s time for your mission. You will be battling First Order TIE Fighters. And don’t forget, there are different outcomes of the mission based on how well your team works together against the enemy. Your skills as a smuggler can follow you throughout Galaxy’s Edge. Characters in locations such as Oga’s Cantina, may already know how well (or poorly) things went for you when you arrive for a “Yub Nub” cocktail. Star Wars: Galaxy’s Edge will open on August 29, 2019, at the Walt Disney World Resort. Here’s a teaser video of what the ride will be like! We’re sure this attraction will be crazy-popular, and you will certainly require FastPass+ to ride! There is a height restriction on this ride. Riders must be at least 38 inches (97cm) or taller. There will be some old favorites as well as new characters that guests will encounter when in Star Wars: Galaxy’s Edge. You will find lots of Disney Characters at a variety of Meet and Greet locations throughout the Studios. Check your Guide Map for times and locations. 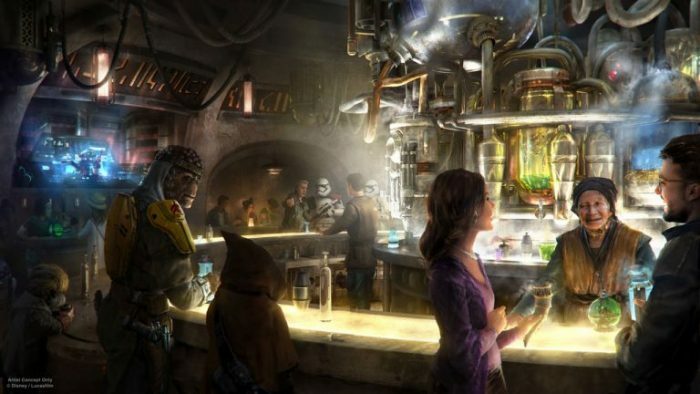 Oga’s Cantina will be the main place to get refreshments in the land. By design and for aesthetic and story-telling reasons, the Cantina is small. To maximize capacity (and turnover) there will be only a handful of booths with seating. Most guests will stand in the Cantina. 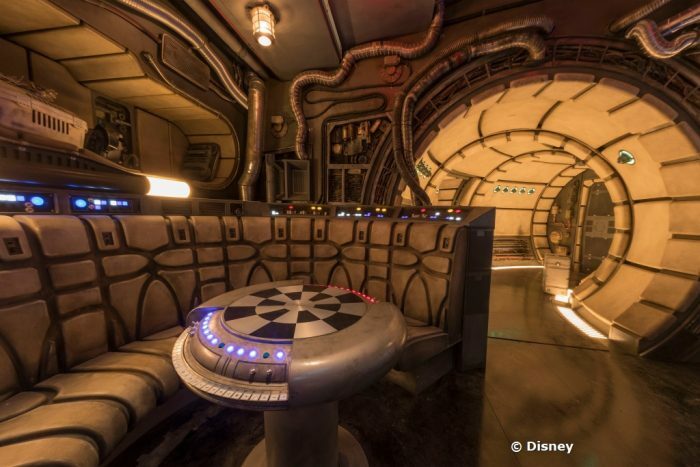 Guests will NOT be able to reserve tables in the Cantina. As you order a drink, be sure to look above the bar — there are tubes and vessels behind the bar that might make it look like your drink is flowing from the ceiling! As for drinks, the famed Blue Milk will be available. This will be a non-dairy drink. 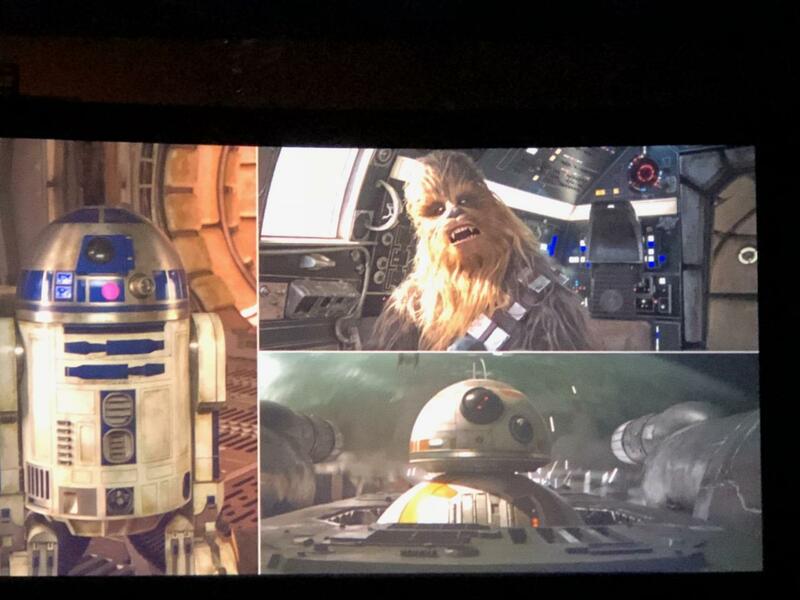 One of the shops in Star Wars: Galaxy Edge will feature customizable droids. Droids that are owned by the same family or group may recognize each other when they meet. No pricing was disclosed on these customizable droids. A full-size R2-D2 may be available with a price tag in the thousands. 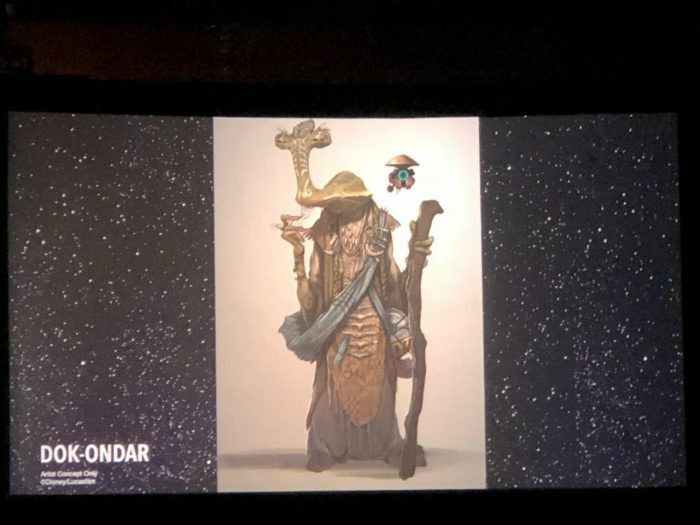 Dok-Ondar, from Solo: A Star Wars Story, will oversee the other shop in the land. He may be an animatronic and even cast members will interact with him when they check if he’s willing to let certain items go. Guests will also find a bazaar-style outdoor market in the land, which may include a pod-racing engine used to roast meat. The music for Star Wars: Galaxy’s Edge will feature original themes created especially for the land by Academy Award®-winning composer John Williams. The all-new music was recorded by the London Symphony Orchestra at Abbey Road Studios. If you have comments or tips to share with others about touring Disney’s Hollywood Studios’ please email me. Thank you.